Super Monkey Ball in virtual reality, but instead of using a gamepad to control the titular sphere, movement is dictated with head-tracking -- that isn't a reductive judgment of physics-based labyrinth Arca's Path, it's just the easiest way of describing the debut game from Dream Reality Interactive. 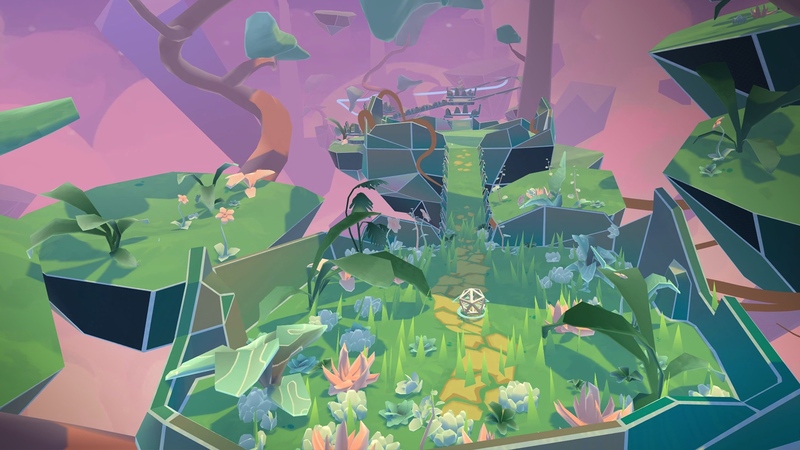 The high-tech marble labyrinth is one of the most relaxing VR experiences I've had. When my demo in publisher Rebellion's hotel suite at E3 began, I thought it was a little weird that the game didn't use a traditional input method. Then, once I started playing, I realized that was beside the point. Instead of directly controlling the hexagonal "ball," I was guiding it around a pastel obstacle course via a cursor and the PlayStation VR's head tracking. The further in front of the ball I moved the cursor, the faster the ball would move. Stopping was as simple as putting the cursor directly underneath the ball. Getting around feels incredibly natural, too. There aren't any tutorials, but thanks to Arca's Path's physics system and minimalist approach to UI (there wasn't a HUD or any sort of pop-up during my demo), the game doesn't need them. Typically in these sorts of games I oversteer and then overcorrect if I'm using a gamepad. But once I became accustomed to making slow, subtle movements with my head rather than quick jerks, maneuvering around the painterly geometric lanes was almost second nature. The two courses I played were shades of pink and green, rife with narrow, walled paths in addition to wider circular platforms filled with angular flora. In motion, it reminded me a lot of PS4's Tearaway Unfolded, which implemented a beautiful, construction-paper-like motif for its visual style. All the while, soothing beats from legendary electronic music label Ninja Tune played in the background. Fairly quickly, I fell into a zen state. I also fell off the path a few times because I'd gotten too cocky when there weren't any guardrails present. Oops. My foibles weren't much of a headache, though, thanks to a generous checkpoint system that should make Arca's Path accessible even for folks who rarely play games. While I demoed Arca's Path on a PlayStation VR, the game will be coming to all major VR platforms including Oculus Go, HTC Vive and Oculus Rift sometime soon. Even as someone whose PSVR collects dust unless a houseguest asks what the headset sitting next to my TV is, I'm chomping at the bit to play more. It's calm, soothing and above all an absolute blast to play. No it isn't action-packed like Battlezone or EVE: Valkyrie are, but thanks to Arca's Path, I've discovered those aren't the types of games I want to play in VR anyway.